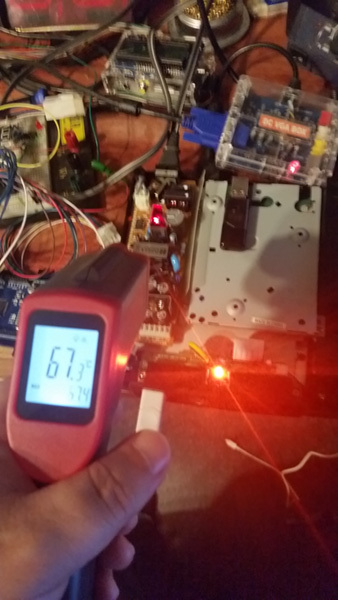 I’ve heard a lot of people talking about Dreamcast cooling related to the GDEMU and USB GD-ROM devices. 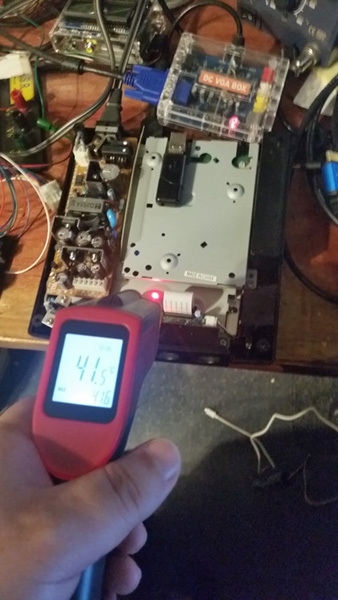 People claiming that by removing the GD-ROM drive the fan is unable to pull cool air across the power supply and other internal components and instead just pulls air through the large opening where the GD-ROM used to be; causing the console to run overall hotter than it did before. A lot of people have asked me if my GDEMU Tray or my USB-GDROM Tray helps with cooling. Without a good answer I decided to test. 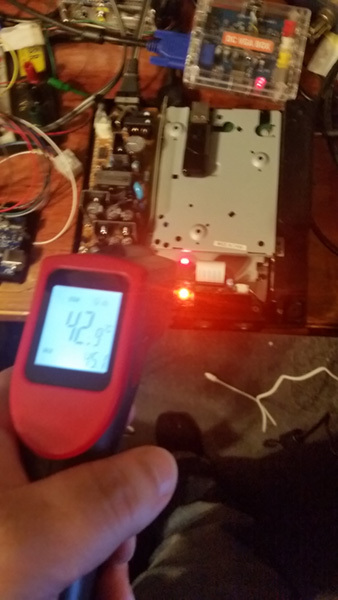 I decided to run Crazy Taxi 2 for an hour with the USB-GDROM Tray installed, measure temps, then run for another hour without the tray, measure temps to see if they rise, and then re-install the tray and run for a 3rd hour and measure temps to see if they go back down. I chose Crazy Taxi 2 because it’s “demo loop” has a lot of fast 3D graphics so hopefully it will stress the Dreamcast in a consistent manor through the whole test. I’m also using a VGA box to ensure that the game is running in high resolution mode. I’ll be measuring 3 things. To accomplish this I took a blemished USB-GDROM tray from my mis-prints bin and cut the bottom out of it, this will allow me to measure the metal plate that the tray sits on without removing it and without changing the airflow, and it will also allow me to easily remove the tray while the Dreamcast is running and without having to unplug the USB Stick. For the test I will be leaving the case screws out to allow me to easily remove the top of the case to take temp measurements, but while running the the lid will be closed and even the modem installed to keep it as close to normal running conditions as possible. 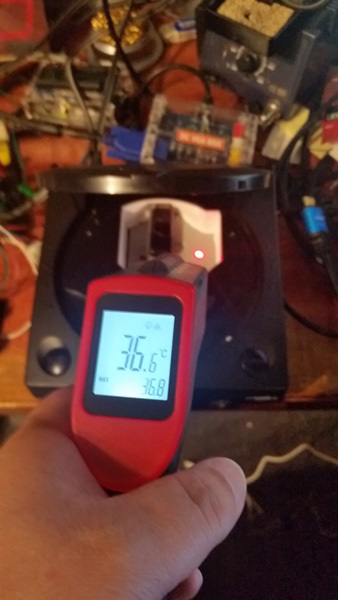 To measure the temps I have an HDE ST380A Infrared Thermometer that I’ll be using to measure the internal temps of the Dreamcast as best I can. Note: You may notice some very minor discrepancies between the photos and the data I posted below. 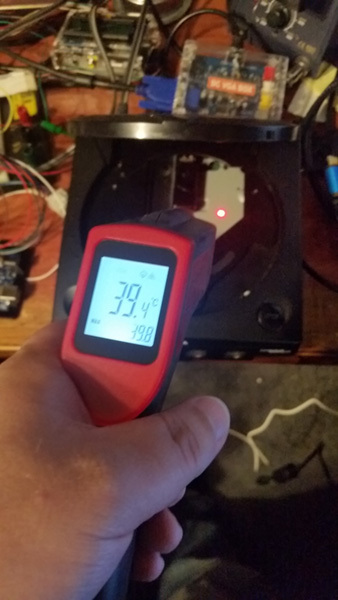 that’s because I will be using the “max” value recorded in the bottom right of the thermometer’s display and not the “live” reading in the center of the display. 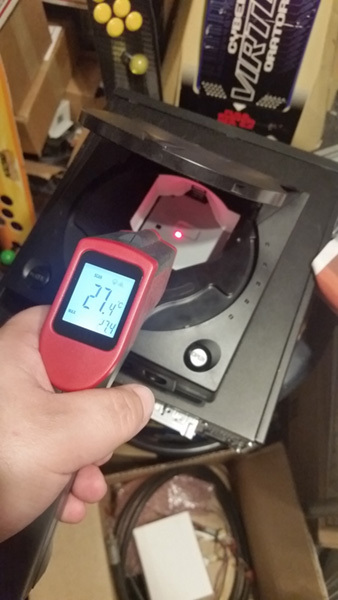 For every reading I wanted to capture the highest temp of the area I was measuring. I ran this test in my office on a hot summer day. 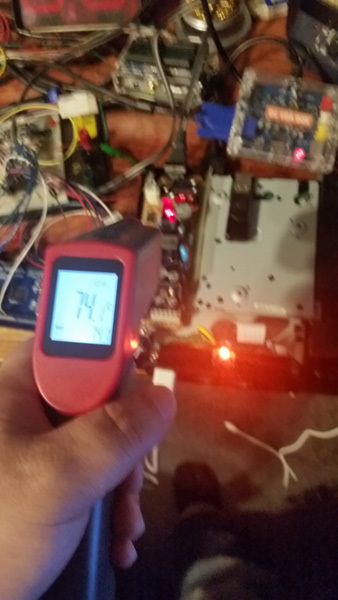 At the Start of the test my desktop thermometer was reading 82F (~27.8C) with 49% humidity. At the end of the testing desktop thermometer was reading 83F (~28.3C) with 49% humidity so fairly consistent through the whole test. My Dreamcast already had the USB-GDROM installed and had been sitting in this room, unused for days. So it should be room temp at start. 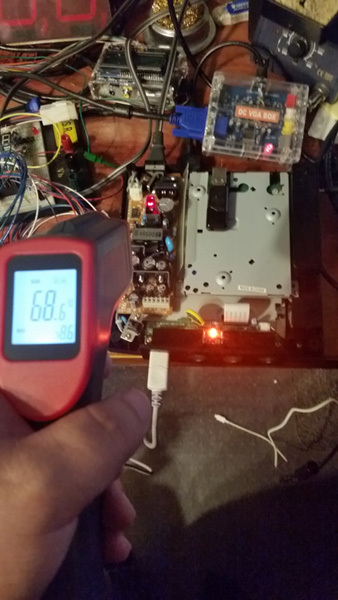 I was able to confirm that my Dreamcast was room-temp before I turned it on to start the test; 27.4C on the IR thermometer. 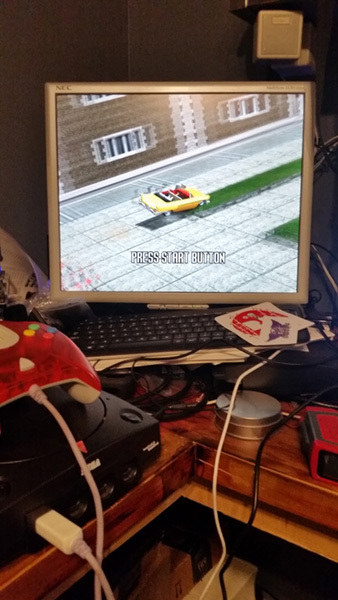 Once I confirmed the baseline temp I started Crazy Taxi running through the Demo Loop. 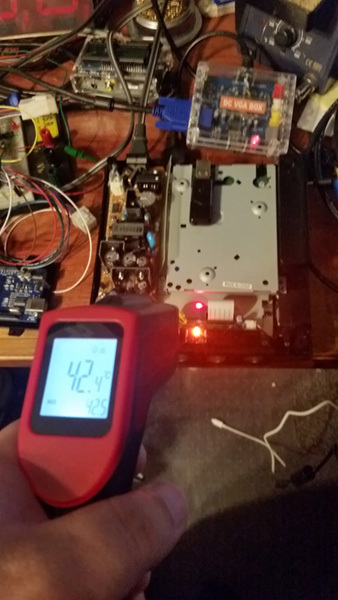 While this testing is rather limited it does seem to indicate that the presence of a USB-GDROM tray improves the cooling in all 3 areas measured, particularly in helping cool down the hottest area; the Power Supply. 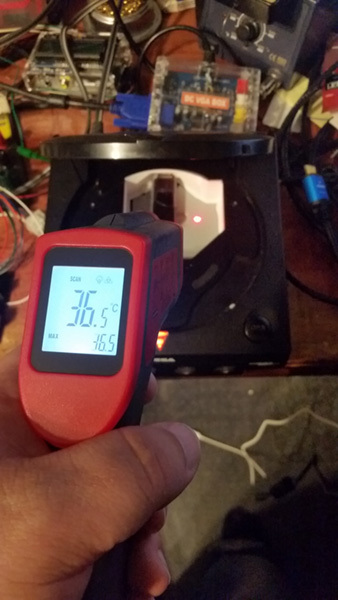 Also worth mentioning is that the GD-ROM plate where the tray sits is well below the 60C glass transition temperature of PLA Plastic, meaning that even the most heat sensitive 3D printed plastics should be safe to use in this application.